Up to 5 lbs. 6 lbs. - 10 lbs. 11 lbs. - 25 lbs. 41 lbs. - 75 lbs. Meade Series 6000 ED APO Triplets are among the finest available optically at any price. Combined with the fantastic qualities of the LX850 mount this package is an advanced astrophotographers dream brought to life. Meade Infinity 50mm Altazimuth Refractor; Aperture: 50mm(2"). Focal Length: 600mm. Focal Ratio: f/12. Rack-and-Pinion Focuser, Altazimuth Mount. Meade Infinity 60mm Altazimuth Refractor; Aperture: 60mm(2.4"). Focal Length: 800mm. Focal Ratio: f/13.3. Rack-and-Pinion Focuser, Altazimuth Mount w/Slow Motion Control Rod. 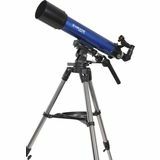 Meade Infinity 70mm Altazimuth Refractor; Aperture: 70mm(2.8"). Focal Length: 700mm. Focal Ratio: f/10. Rack-and-Pinion Focuser, Altazimuth Mount w/Slow Motion Control Rod. 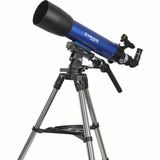 Meade Infinity80mm Altazimuth Refractor; Aperture: 80mm(3.2"). Focal Length: 400mm. Focal Ratio: f/5. Rack-and-Pinion Focuser, Altazimuth Mount w/Slow Motion Controls, Three 1.25" Eyepieces (MA6.3mm, MA9mm and MA26). 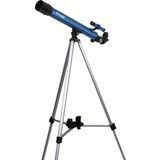 Meade Infinity 90mm Altazimuth Refractor; Aperture: 90mm(3.5"). Focal Length: 600mm. Focal Ratio: f/6.7. Rack-and-Pinion Focuser, Altazimuth Mount w/Slow Motion Controls, Three 1.25" Eyepieces (MA6.3mm, MA9mm and MA26). 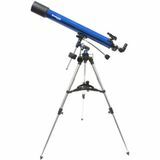 Meade Infinity 102mm Altazimuth Refractor; Aperture: 102mm(4"). Focal Length: 600mm. Focal Ratio: f/5.9. Rack-and-Pinion Focuser, Altazimuth Mount w/Slow Motion Controls, Three 1.25" Eyepieces (MA6.3mm, MA9mm and MA26). 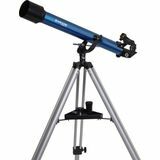 Meade Polaris 70mm German Equatorial Refractor: Aperture: 70mm(2.8"). Focal Length: 900mm. Focal Ratio: f/12.9. Rack-and-Pinion Focuser, German Equatorial Mount w/Slow Motion Controls, Setting Circles, Latitude Control w/Scale, Three 1.25" Eyepieces. Meade Polaris 80mm German Equatorial Refractor; Aperture: 80mm(3.2"). Focal Length: 900mm. Focal Ratio: f/11.3. Rack-and-Pinion Focuser, German Equatorial Mount w/Slow Motion Controls, Setting Circles, Latitude Control w/Scale, Three 1.25" Eyepieces. 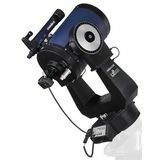 Meade Polaris 90mm German Equatorial Refractor; Aperture: 90mm(3.5"). Focal Length: 900mm. Focal Ratio: f/10. Rack-and-Pinion Focuser, German Equatorial Mount w/Slow Motion Controls, Setting Circles, Latitude Control w/Scale, Three 1.25" Eyepieces. 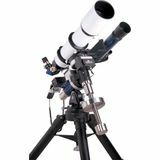 This 16" LX600 has 16" diameter f/8 ACF optics (focal length 3251mm) and Ultra-High Transmission Coatings (UHTC) for maximum image brightness and contrast. Sold without tripod, pier or wedge, ready for your own custom mounting. 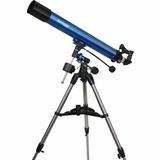 Ideal for both astronomy and terrestrial viewing, a refractor telescope (also called a refracting telescope) is a telescope that uses a glass lens to collect light, which is bent (refracted) to form an image. 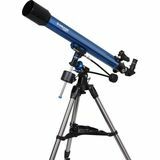 Refractor telescopes are known for providing crisp, high-contrast views and are wonderfully suited to observation of bright targets like the Moon, planets, and terrestrial subjects. 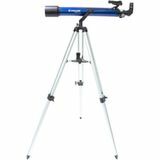 Inexpensive refracting telescopes make great starter scopes because they are highly portable, easy to maneuver, and require virtually no maintenance. 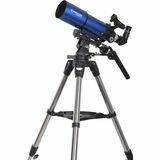 Short refractor telescopes that utilize special glass and/or multiple-lens designs are popular among serious astrophotographers.